This is a full moon bursting with optimism, faith, adventure, buoyancy and joviality. It’s the vision quest moon, the moon for future visions and boundaries expansions Moon in Sagittarius is opposite the sun in Gemini, reminding us of the need to strike the balance between the future and present, unity and diversity. Can we easily translate our philosophical, spiritual and intellectual ideas into everyday language in order to be able to relate to many? Or do our lofty ideas never reach terra firma? In order to connect with many, we need to be mentally dexterous and adaptable with our language, a talent of Gemini. Wisdom alone can be solely in the head, unless it’s lived out in every- day reality and communicated diversely. Sagittarius’ ruler Jupiter happens to be appropriately stationing direct today, which enhances significantly the Jupiterian energy of this full moon. Our attention moves to home, family, security and comfort. The flowers, while blooming need nurturing to come to ripen as do our personal needs and desires. This new moon is a magical one, happening on the heels of the summer solstice. Pluto trines Venus; spiritual growth and transformations through love and creativity. A month ago at the Gemini moon, Pluto was square Venus, this tension has been resolved. Relationships continue to be a vehicle for growth, rebirth and transformation but in a less disruptive, stressful way. Home and family are areas where your energy needs to be poured into. Whether you’re moving house, renovating or uprooting in some way, there are intense changes that may come out of the blue within home, family and community. The Sagittarian full moon on 9th, sheds light on your quest for higher meaning and purpose, opening up a wide range of possibilities available to you, through intellectual and physical voyages. Venus, goddess of love and beauty is in your sign, where it is exalted, imbuing you with extra charm and attractiveness. Socially and romantically this is a happy, successful time. The new moon on 24th highlights what is meaningful and of value to you, what needs to be preserved and what attachments are holding you back. Your ruler Mercury joins the Sun in your sign, as the sojourn with Mars ends, Mercury takes his place. You’re like a butterfly gathering nectar from many flowers, on a social and intellectual level. Relationship wise, something comes full circle and a new cycle begins. A reality check takes place and you wake up to the realism of a situation. It’s your ,birthday month and Mars, moves back to your sign on 5th, which only happens once every 2 years so make the most of the extra energy, power and confidence. You have the desire to move ahead with your goals and reinvent yourself. As the Sun returns to your sign to unite with the moon on 24th with sprite like Mercury, this is looking like a midsummer night’s dream. Venus moves into your area of friendships; this should be a very sociable time with lots of fun and love. While you are making plans for the future, remember that the old chapter has to be closed before the new exciting one can begin. This is a meditative time when you are particularly attuned to the collective unconscious. Listen to the messages of your dreams and follow intuition. You are needing to make some significant decisions concerning home, property. There are expansions and opportunities happening here but they require some careful planning beforehand. With Jupiter moving direct once more in this area of your life, there is cause to celebrate. Friends and associates are a helpful, nurturing source of growth and nourishment. Jupiter is direct again as from 13th.You’re restoring your equilibrium by finding that balance between ‘you’ time and time with others. A fresh wind is blowing in your direction. The new moon on 24th breathes new life into your career and whether you’re starting a new job, changing vocation or just feeling enlivened with an existing one, there is a blossoming taking place. You are developing an improved way of dealing with your finances, by understanding the connection between the physical and metaphysical quality of money. This month finds you in an upbeat, jovial mood with plenty of reason to celebrate, with new possibilities for expanding horizons and putting into practice your ideas and philosophies. Travel and movement, near and far, are forecasted. You have a trip down memory lane this week as you revisit a place from the past. The full moon in your sign marks the beginning of a new journey but you need to release from the past what you no longer need, so that you are free to travel lighter, literally or metaphorically. Jupiter your ruler turns direct on 10th. A renewed, expanded you is emerging, ready to aim your arrows at new horizons. With Saturn retrograde and the new moon on 24th in your relationship area with Mars there too, you’ll be letting go of the old elements that aren’t working and embracing the new in a relationship. You are becoming more flexible, less controlling and able to allow life to unfold of its own accord. Venus conjuncts Uranus on the 3rd, expect a shift in a relationship. You are in need of some breathing space but don’t be a hermit. Your social life is amped up with the full moon on 9th. New developments at work arise for you, whether it’s a new vocation or a new attitude to your current job, there is change brewing. With the new moon on 24th illuminating the area of your chart relating to joy and creativity, it is time to focus on things that give you energy and fuel your passions. Your creative side demands nourishment. Children are also particularly important during this time. Neptune, your ruling planet, stations retrograde on 16th for a 5 month journey backwards, marking a reflective period in which to connect to your soul’s wisdom and intuition more fully. You will be re revisiting some of your dreams and sieving out your ideals and fantasies. 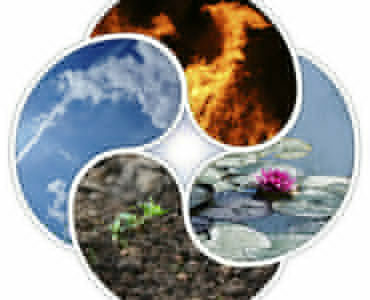 The four elements of nature: fire, water, earth, air. Designed in a quadruple yin yang symbol.